Who likes to rock the party? We like to rock the party. 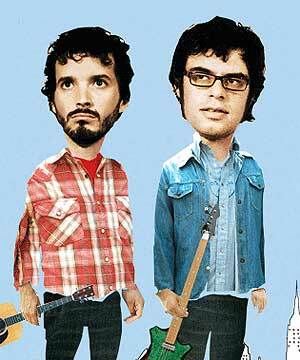 Thanks to Arj Barker making mention of during his show, and a couple of friends recommendations I’ve recently discovered Flight Of The Conchords a very dry/funny TV show about a New Zealand duo/band “Flight Of The Conchords” with members Jemaine, and Bret, and their NZ manager Murray all living in New York. Arj Barker has a small role as Dave the guy who works at a pawn broker. They break into song a couple of times in each episode, taking off many music/video styles/bands, very funny! Unless you know where to look *wink*, or buy a DVD from OS you’ll have to wait until channel 10 decides to air the series. I highly recommend checking it out.